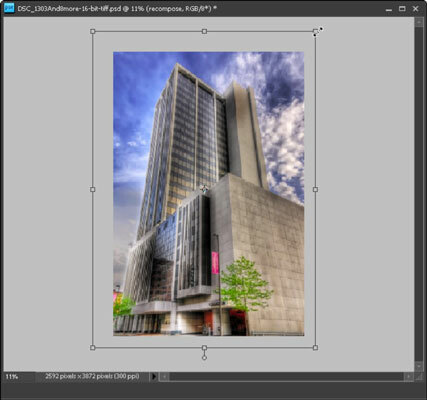 Correct any lens distortions and straighten your HDR image in Photoshop Elements by choosing Filter→Correct Camera Distortion to open the Correct Camera Distortion dialog box, as shown in the figure. Remember that you’re working on a duplicate layer built up from all the previous steps, and you could be up to eight or ten layers by now. Wait until you’re almost done editing to correct distortion and straighten an image because these corrections (and the following one) change what pixels are visible onscreen. If you want to come back and alter how you corrected the distortion or recomposed the image, you don’t have to start everything over from scratch. You simply pick up at the last layer, duplicate it again, choose Filter→Correct Camera Distortion, and change the settings you used earlier. You can sometimes combine this and the next step if you don’t have any distortion to fix. Save recomposing for last in your editing process, for the same reason you wait to correct lens distortion next-to-last. 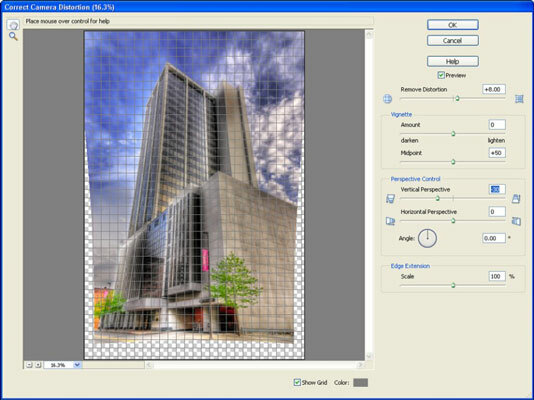 Transform images by enlarging this layer (see this figure) rather than cropping the entire image. You can see the drag handles and border outside of the image frame — this area is the actual extent of the image and is effectively cropped from view by this technique. There are some drawbacks to this — mainly that it takes up a lot of memory and can make performance sluggish. If your computer can handle it, however, this method preserves all the layers underneath in their uncropped state. If your computer is getting sluggish because your image file is too big and bulky (hence the overall memory load is getting larger and larger), save the file, and then simplify your layer structure by deleting everything but your uppermost working layer and background. Save the image as a new working version with a new filename. Continue working in the new, slimmer file — starting where you left off. You can also choose Select→All and then Image→Crop to erase everything outside the image boundaries. This deletes all the super-sized extra stuff.